I continue to believe that is true, but now that I have another marathon under my belt – a marathon during which I bonked, no less – I feel like I’ve learned a thing or two about sport fuel alternatives. I’m not knocking the gel-lovers out there; if you like it and it works, good for you! But there are lots of options available for those of us who don’t want to swallow things like “glycerol ester of wood rosin” or “yellow #6” during our next race. So back when I wrote “A Real Conversation…” I suggested that “real food,” essentially meaning raw food, was how I planned to fuel my long runs, so I started experimenting with carrying food. While it’s true that I was happy to see the banana in my pocket at mile 9, I was pretty miserable about it while it bounced around in there. But there are happy mediums, and by sharing what I like hopefully I can help you find one that works for you. And if you know of something I don’t suggest here, please share it with us in the comments! Carrying fruit can be a real drag…literally. Bananas are high in potassium, which is great while you’re running, but they’re big and unwieldy, unless you luck out and find a small-sized bunch. I kind of dig packing a banana into the waistband of my shorts, and can run pretty comfortably with that for a while, then I tried other fruits. Orange wedges in a baggie are a favorite. Little mandarins can work too (nature’s individually packaged treat! ), but peeling them while running is a pain. I tried carrying apple slices while wearing (sadly discontinued) highly engineered LuLuLemon shorts, which are fitted tight to the leg and have many pockets, including a big pocket that sits low on the thigh. It’s a pretty secure position for most stuff, but my bulky fruit just didn’t work; it bounced and flopped and mostly I just gave up and held the damn bag in my hand. Then I had the bright idea to try a cycling jersey! Cyclists are so smart sometimes; they put big giant pockets in the back of their shirts so they can carry all manner of weird things on their long rides. For us runners, used to traveling light, it’s the equivalent of having a carry-on. Guess what fits perfect in there? A banana, a baggie full of orange slices, my keys, my phone, sunglasses, a weekend’s worth of clothes, a pair of heels and my favorite umbrella, just in case. If you’re gonna try to be a whole-food-carrier it’s worth looking into a couple of cycling jerseys. They even make cycling tank tops with pockets! Single serving natural nut butter is sold at my corner deli, and it comes in almond butter with honey, which is like…oh god, so good. They worked really really well and are conveniently packaged similar to a gel. I like them and still use them! I do not know how available these little squeeze packs are, but you can buy them online, if you’re so inclined. Another good option I found was a mix of half pretzels, half dried apricots. The pretzels aren’t hippie-approved by the Low-Fat-Raw-Vegan Society of Paleo Foods but combined with apricots it’s a sodium-potassium one-two punch. Dates are kind of like real-food-runner manna. They’re portable, they’re dense in calories and carbs for a fruit and they taste like candy. Technically they’re fruits, but I like to think of them as edible magic. I feel like everyone must know about date balls by now, right? When I was doing the raw Vegan thing those little balls saved me from many a late-night cookie attack…but what’s really cool about them is that you can use them as a base and add in other nutritional needs, namely salt, which is always a problem when you’re using real food for fuel. But it’s not a problem when you’re using date balls – sea salt tastes great in them. So does coconut, cocoa powder, dried blueberries… I recommend trying them with cinnamon, because everyone loves Cinnamon! Get it? Get it?? The best, most important of these factors is #3, because the god’s honest truth is that if I can’t buy it at a store near my home, I will probably not use it consistently. Frankly, I’m even willing to go a little out of my way to find something if it’s good, but if I have to order it online I probably will just opt for something else. Pro Runners Fleshman & Rothstein’s famous Picky Bars are like Larabars except 20 times better, for instance, but I have to make a special trip to REI to get them. When I’m near REI, I get them. Otherwise, Larabars are just fine. It’s worth noting too that most flavors contain six or less ingredients–my favorite is cherry pie, which consists of dates, almonds and cherries. Consume with water. Otherwise you’ll be smacking your tongue on the roof of your mouth like a St. Bernard who just ate a jar of peanut butter. Now I know there are many other fine products out there; I simply haven’t tried them, with the exception of a thing called FruitChia Bars, These are extra appealing to your inner hippie because they contain chia, the magic food of native Mexicans and Christopher MacDougall! Eat the chia and rejoice in your ability to commune with the earth beneath your bare FiveFingers*. I don’t know how readily available these things are in stores; I find them at an organic bodega in Brooklyn. But if you can find them they’re pretty yummy and are loaded with potassium. I haven’t looked into how they make their concentrates or anything, so I can’t really attest to their “naturalness” or whatever. But I like them. They make me feel like a Tarahumara in the most wonderfully self-indulgent way. *I do not wear FiveFingers. Provided they are readily available at your Local Running Store or some other retail outlet near you, prepackaged all-natural sport foods are the most likely candidates to fulfill the Holy Trinity of Running Food because the ingredients have been measured with endurance athletes in mind. They are then wrapped up in servings appropriate for athletic consumption. Some are gelatinous. Some are food-like. Some are gummy. All of them appeal to me, because as I said above I am lazy and a sucker for convenience. I do not want to separate potato chunks into baggies, I want to pin the thing on my shorts and then eat it as quickly and painlessly as possible when the need arises. My greatest love of the prepackaged, all-natural sport food category is the Honey Stinger Waffle. This thing could be more accurately described as a cookie. It tastes like a cookie, it sort of looks like a waffley cookie and it’s made out of flour and sugar and comes in vanilla and chocolate flavors. Yum. It is not raw food in pure vegetative form or anything, but it is all organic, and, with the possible exception of soy lecithin, all-natural. So if you’re going to eat a cookie for your running fuel you’re probably doing okay with it. If you’re a hippie purist like I was when I wrote “A Real Conversation…” you should probably scoff at the waffle and chomp some date balls instead. Embarrassing anecdotal interlude: yes, I bonked at the marathon. No, I did not eat enough, and here’s why: I made the mistake of choosing Honey Stinger Waffles as my mid-race fuel. They had done very good things for me during my long runs (during which I carried water) so it seemed like a good idea at the time. As it turned out though, race day was much warmer than expected and the first waffle dried out my mouth really badly, about half a mile out from the next water stop. After that I couldn’t even think about eating another one. Added together with far-less-than-adequate water intake in the first half, my fate was sealed by mile 9, and at mile 14 I went down hard. The moral of the story is that, while yummy and cookie-like, waffles are dry, and in my opinion they are therefore a terrible choice for racing fuel. Honey Stinger also makes gels and fruit chews. Since “regular” gels nauseate me I’ve never tried the gels (Mint has tried them), but the chews are pretty good. They’re about as “natural” as a gummy thing can be (which isn’t very), and are colored with stuff like carrot juice and annatto (a natural dye made from achiote seeds, which sounds like something Born to Run acolytes would approve). Still, they push the limits of hippie eating and they are processed enough that I would not necessarily call them whole food. I mysteriously have stockpiled CLIF Shots from race goodie bags, and one day I discovered that really… CLIF products aren’t so bad as these things go. CLIF Shot Energy Gels contain relatively few ingredients; but the first one on the list is organic maltodextrin, so if it’s the processing of your foods that bugs you these may not be a good choice. Maltodextrin gets a bad rep because it’s sugar, but remember, sugar is good when you’re trying to not bonk! Read up on it and draw your own conclusions. For my purposes, these wouldn’t be my first choice, but they would be a welcome back-up if I couldn’t find something less-processed. And since I had like…twenty of them in my junk drawer, clearly I’ll never say no to a free one. There are a zillion other products out there that you can order online, but because I know that realistically I will only consistently use what I can buy and have in my hand today, I chose not to go that route and I stuck to items that were readily available locally. Through my trial and error I’ve found that what works best for me are Lärabars, almond butter packets, and orange wedgies (yep, wedgies). I will never again try to eat a dry cookie during a marathon. I will always drink water with my food. And dammit, I will enjoy my orange wedgie, because it’s all I ever really wanted in the first place, when I started this whole process. Have you tried whole foods as fuel during a run or during a race, or would you? Is there a good one I missed? What has your experience been? I grabbed an orange wedge just ONCE during a marathon, and it was bitter! The taste stayed in my mouth for a while, since I wasn’t near any water, so I am hesitant to try it again mid-race. Date balls are delicious and are like Larabars, but much cheaper to make! I’ve trained with Clifshots and they work pretty well for me. I also eat Clifbars, not when I’m running, but when I go on longer cycling rides. Highly recommended with dates, and coconut water. For ironman a distance triathlons I still go with the complex carb drinks on the bike because you just can’t “eat” the amount of fuel you need. As a “pokey trail-head doing long distances”, I can’t comment on what works when running a fast marathon… but for long trail runs, I usually pack a combination of dates, Larabars (which — important for Minnesota winter running — DON’T FREEZE! ), Picky Bars, and gels. I drink water and use S-Caps for electrolytes. Good to know, Robyn! I would love to try picky bars, they sound really great! But they just aren’t readily available here in New York. And make no mistake, I’m not dissing trail runners! Just acknowledging in my own brash way the difference between what works for that kind of run and what would work for me during a road race. I’ve maintained a Paleo template for over 3.5 years, but when it comes to running, I’ve stuck with the occasional Gu chomp or Cliff gel simply because I’m lazy. If they could package Nutzo in tiny runner packs I would be hooked. Good for you for sticking to all-natural foods! Have you looked at PocketFuel? They’re gels made from natural nut butters, and I’ve seen them at REI. Their flavors are a little weird though…why bother flavoring when you’re using almond butter? I kind of don’t get it. But the Justin’s packs are really great. If you see them somewhere I highly recommend trying them out! I’m with you on the holy trinity of running foods. I’m willing to order online, so availability isn’t as big a deal to me. My problem with Larabars is that I have a propensity to eat them when not running. Definitely not something I would do with gels. I also have a couple of cycle specific gear things that I love for running. 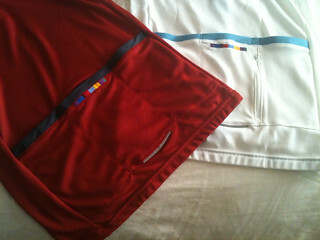 The pockets are super convenient and the cut usually covers the junk in the trunk! The main drawback is that the cycle gear is less likely to have reflective elements. Whatevs. To me the problem with gels is that I wouldn’t eat them outside of running! Haha! Different perspectives are funny. Reflectors are a challenge, yeah, but you can always tape, yeah? Or like…I have this running cap that’s bright orange and made from Asics Vizipro fabric. You could use something like that. Cycling pockets are the awesome; I can’t believe running clothes haven’t adopted them, but I guess most runners don’t carry around nearly as much stuff as I do on my long runs! For anyone looking for an alternative to cycling pockets, I also found the FlipBelt by Level to be very handy for carrying boatloads of stuff around. I’m still experimenting with things to eat on long runs. I can’t stomach gels and it just seems kind of wrong to use sugary/chemical type stuff when there has to be something natural that will do the job. I used Clif Bars cut into little pieces and stored in a ziplock bag for my marathon. On my recent training runs I have been trying raisins and almonds which I really like and seem to give me an energy boost. In the hotter weather ( as in no Polar Vortex) I think I will try adding gluten free pretzels for the salt. I also just bought Sasha Co. buckwheat snacks to try on a run. They are little balls of buckwheat groats, sunflower seeds and dried fruit with agave syrup – quite yummy! I ingest as little as possible during long runs and marathons. I do use Hammer Endurolytes and sport beans. I’ll stick a sport bean in my cheek (like I expect people do it with chewing tobacco) and let it slowly dissolve. A woman I ran with last summer said she uses purple potatoes during iron man events because they are higher in nutrients and smaller in sizes so easy to carry. You have given me an idea with oranges. 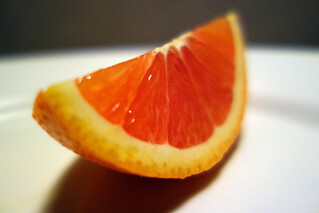 Clementines are less juicy and smaller than oranges. I’ll try this tomorrow on my long run. The Honey Stinger fruit chews are my go to! I love those things. The potatoes are a cool ultra idea, I will have to try that if I ever do one again 🙂 I also have been meaning to try dates on the run forever, since I love them as just a normal snack! Thanks for this post! I’m currently training for my first marathon and am still trying to figure out what type of fuel works best for me. My stomach doesn’t always agree with me on my long runs. I haven’t tried gels and I really don’t want to because I try to eat mostly healthy real foods when I’m not running. I think I tried the honey stinger sports beans when I did my half marathon a couple years ago.